*Salutes* Captain Alex Cavanaugh 's ninja reporting! He and Ciara Knight are both every author's greatest supporter and friend. Today they're hosting the "Did I Notice Your Book Blogfest". "Post about a book you’ve noticed. You can choose a book that you’ve read, something you saw on a blog or social media site, Goodreads, or a sales website. Anything that caught your eye because of a great cover, blurb or reviews, but DON’T tell the author that their book has been noticed. Instead, shout out on social media sites, and encourage others to do the same, until the author finds his/her book. Leave a blog comment at Ninja Captain Alex’s BLOG or Ciara Knight’sBLOG when the author finds their book. 2) The book shouldn’t be on the New York Times or USA Today bestseller list. This is your chance to shout out about a book that might not have been noticed by others." I found this book via the author's website which I'd followed because of her lovely pictures and descriptions of Provence, France. The author, Deborah Lawrenson, also wrote snippets from the book before it was published. I read it and found it a gem. 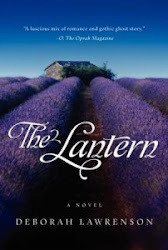 If you want to be transported to the lavender fields of Provence, splash on Lavande de Nuit scent, or wander the cobbled streets of Cassis, while immersing yourself in a compelling tale of betrayal and intrigue then "The Lantern" is a book for you. It's certainly one I will keep and dip into again and again. When Eve falls for the secretive, charming Dom, their whirlwind relationship leads them to purchase Les Genevriers, an abandoned house in a rural hamlet in the south of France. As the beautiful Provence summer turns to autumn, Eve finds it impossible to ignore the mysteries that haunt both her lover and the run-down old house, in particular the mysterious disappearance of his beautiful first wife, Rachel. Whilst Eve tries to untangle the secrets surrounding Rachel's last recorded days, Les Genevriers itself seems to come alive. As strange events begin to occur with frightening regularity, Eve's voice becomes intertwined with that of Benedicte Lincel, a girl who lived in the house decades before. As the tangled skeins of the house's history begin to unravel, the tension grows between Dom and Eve. In a page-turning race, Eve must fight to discover the fates of both Benedicte and Rachel, before Les Genevriers' dark history has a chance to repeat itself. Hope Deborah finds her book! Oh, that is a really gorgeous cover! The story sounds a little like Rebecca, but I love that it sounds like it adds a haunted house to the equation. That sounds very interesting. The cover is very mysterious to me. Thanks everyone for commenting - it is a good book. Gorgeous cover and interesting blurb! Sounds like a awesome book. I love the setting! Hi, what a wonderful setting for a mysterious romance. It reminds me a little of the classic tale, 'Rebecca.' It has great cover art too. What a lovely surprise, Sue - thank you very much! All the best to you and hope your writing's going well too. Debbie found her book. Great for her. Stunning. I'm pinning this. Thanks, Susan! Susan, it sounds fabulous. THanks for introducing us to this book. Sounds interesting. Great cover. Thanks so much for participating in the DINYB Blog Fest. Sounds really interesting. I love the cover. One note, when reading the summary, the line "the secretive, charming Dom," I assumed that meant dominant, rather than a man's name. :( Damn you 50 Shades! this one is a must read for me -- I lived in the South of France for two years in the early 80s and everything about it was magical. Thanks for noticing The Lantern. It's now on my TBR List. Wow, wow, wow! I have a thing for the colour purple. There are so many good books out there! I like your review. That alone makes me want to read the book. I love page turners. This sounds like a good one! Thanks everyone for commenting. How I love blogfests - it's the best way to meet new people. Sounds like a wonderful read. I love the sense of eeriness from the blurb. Great choice! a website that's connected to multiple lenders.